Look, we're not gonna say something like Behold, mortals, the dread skull head nears, and the blood debt will soon be repaid! We're not going to say anything like that, but we need to get on the table upfront that it would be warranted -- because an ASTEROID WITH A SKULL ON IT on it is about to sail past our beloved planet Earth. The Grinning Harbinger of Ill Tidings will visit us on November 11, according to Live Science. It's referred to by actual scientists as Asteroid 2015 TB145, which isn't great branding, but they're scientists, after all, not Instagram influencers. CNET reports that it's also been referred to as the "death comet," the "Halloween asteroid," and the "Great Pumpkin." Whatever you call it, it was discovered back in 2015, when it came within 301,986 miles the earth on Halloween. Which, as the scientists say, is extremely spooky. 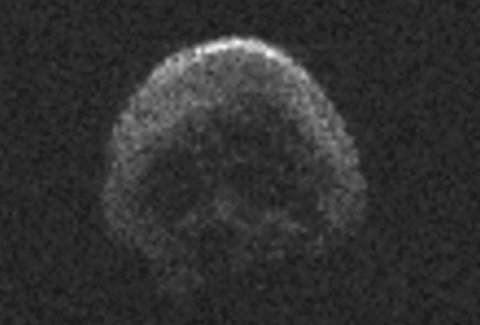 Pictures of the asteroid taken by National Science Foundation's Arecibo Observatory in Puerto Rico were magnified, and the resulting the image resembled a human skull. CNET reports that scientists believe it's a dead comet (spooky!) measuring about 2,000 feet in diameter. When it makes its trip to us this year it'll be significantly further way, roughly 24 million miles from Earth. And again, it'll unfortunately be late for Halloween. It won't be back again until 2082, so if you need it for any occult rituals, make sure you mark your calendar.